Kule’s book shows us a boy who rose from nothing – he was a German survivor of WW II –driven by the simple statement of his mother during a time of dire poverty, “You will never go hungry, if you become a chef.” Germany’s youngest master chef at age 27 in 1970, Friedemann Paul Erhardt landed in Philadelphia in 1972, because of a chance relationship with a former Miss Philadelphia. Serendipity and his ebullient personality placed him on syndicated television shows two years later, catapulting his star across the nation and creating a brand-new culinary genre: the TV showman chef. Within months, 40 million Baby Boomers watched regularly as he taught, cooked and entertained his way into their hearts for the next three decades. The relationships – the professional successes and the personal failures — brought to life in the story give us a real sense of connection with the man, who shall forever be known as Chef Tell. Chef Tell was a chef’s chef, beloved in the world of chefs. He was a big man with a generous heart who, very simply, cooked great food. More than that, he entertained with boundless energy, making hundreds of TV show appearances and performing live cooking demonstrations before thousands in large venues. He relentlessly pursued excellence with his five, award-winning restaurants. His correct discernment of opportunities as they presented themselves was uncanny. He had the courage of a pioneer, the soul of a teacher and the charisma of a star, which he became. 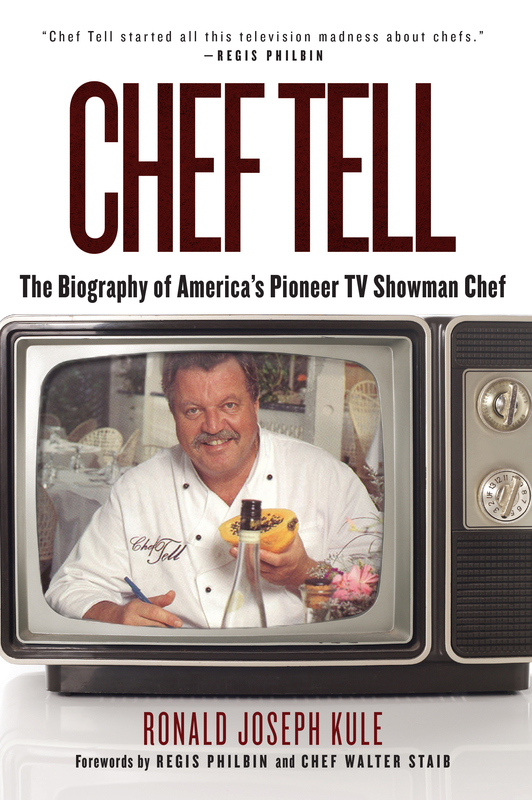 We hear famous chefs make their pronouncements on shows like ‘Chopped’ and ‘Food Network’s Cooking Channel’, but what we don’t hear is how these judges, and every other celebrity chef, got there, because, until now, we haven’t known the whole story of the person on whose shoulders they are standing: Chef Tell, America’s pioneer TV showman chef. The book’s narrative is rich in detail gleaned from interviews with those who knew him personally, without bogging down into a dry recitation of facts. The author shows us that we advance not so much because of the people we know, but because of our ability to create relationships in whatever profession we choose. For those who want to advance in the culinary world, and for those of us who want only to appreciate better the labor of love with which our favorite chefs delight our taste buds and nourish our bodies, this is a good read. FIVE STARS.